When travelling through Thailand, I slurped down more bowls of soup than I could count. And that’s saying something, given the weather was averaging 105°F / 40°C! Although my memories of this trip get fuzzier with each year, I still remember being amazed at how a single bowl of soup could pack so much flavor. I couldn’t get enough. And perhaps best of all, it isn’t as hard to make at home as you might think. Tom Yum (or Tom Yam) soup is also known as Thai Hot & Sour Soup. There are two main types: one with a clear broth, and the other with added milk. Both are loaded with spicy and sour flavor, thanks to a handful of aromatics, chili and fresh lime juice. This recipe features a good splash of coconut milk, which rounds out the flavors and adds just a hint of vegan-friendly creaminess to the already flavorful broth. If coconut milk isn't your thing, leave it out, or check out this recipe instead. Yes, I really love Tom Yum soup. And while traditional Tom Yum uses shrimp or other meat, as you’ll see, you can coax out just as much flavor without it! 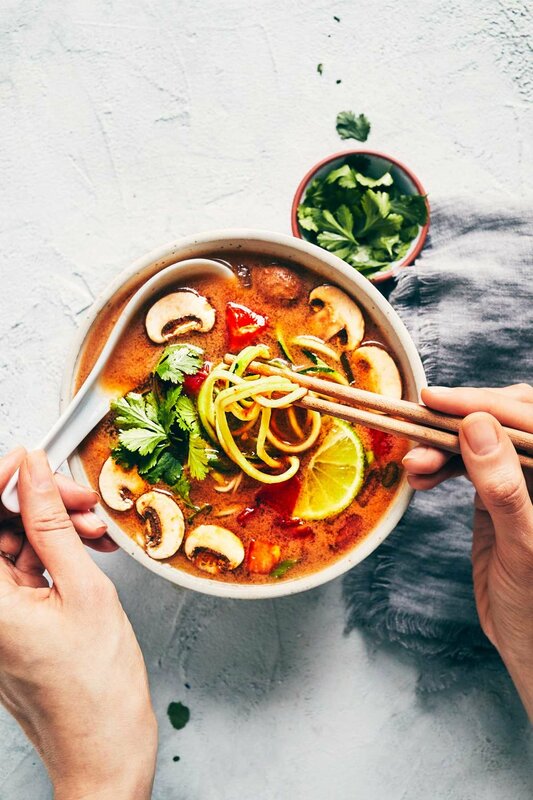 While this soup is by no means high maintenance, you’ll likely need to visit an Asian grocery store to pick up some of the ingredients. The lemongrass, galangal, and kaffir lime leaves are pretty integral to the flavor, so I don’t recommend skipping out on them. Thankfully, you can freeze extra galangal and kaffir lime leaves, in case you buy more than you need. Just make sure to store them in separate air tight bags and use within 1-2 months. After many rounds of testing, I think the one specialty ingredient that you could swap out are the Thai red chili peppers (also known as Bird’s Eye Chilis). Although they’re readily available at most grocery stores, you can compensate by adding a bit more Sriracha at the end instead. If you can get ahold of them, I do recommend adding the finely diced Thai red chilis to the soup base, so that the spice can infuse as the soup cooks. These little peppers bring the heat, so to err on the safe side, the recipe calls for two peppers. You can add more spice at the end (if needed), but it's harder to go the other way around. Still, expect this soup to be spicy...otherwise calling it a Hot & Sour Soup would feel like a bit of a let down. Don’t you think? Zucchini noodles make to this soup more substantial. They add freshness and crunch, and are a hassle-free way to pack in extra veggies. You can quickly spiralize the zucchini noodles while the soup boils, and then add the “zoodles” to each bowl before ladling the hot soup on top. Since it’s usually just the two of us, this recipe makes the perfect amount for our dinner and lunch the next day. Pro tip: Store extra zoodles in a mason jar, then pour in the reheated soup when you’re ready for lunch. It makes for a healthy, satisfying and delicious meal, no matter what! Slice the thick ends off each lemongrass stalk (1-2" or 2.5-5 cm from the bottom). Use the back of your knife to pound each stalk lightly, to help release the oils. Slice each stalk into 3-4" strips (7-10 cm). Heat a large pot over medium-high heat. Once hot, add oil and lemongrass stalks. Cook for 3 minutes, stirring regularly. Once lemongrass is fragrant, add diced onion. Saute for 2 minutes, or until onion begins to soften. Then add garlic and galangal, cooking for 1-2 minutes until fragrant. Reduce heat if needed to prevent garlic from burning. Add vegetable stock, Thai red chili peppers, and Kaffir lime leaves. Bring to a boil. Once boiling, reduce heat to medium-low and cover with a lid. Simmer for 20-25 minutes. Then, use a slotted spoon to remove lemongrass from the pot and discard. While the soup boils, use a spiralizer to turn your zucchini into “noodles”. Once the lemongrass is removed, add tomatoes and mushrooms to the soup. Simmer, uncovered, for approximately 5 minutes, or until the vegetables are soft. Season with ¼ cup lime juice, tamari, coconut sugar and coconut milk. Stir to mix well. Taste soup, and adjust seasoning by adding more lime juice and Sriracha if desired. To serve, transfer zucchini noodles into bowls. Ladle soup on top. Garnish with chopped cilantro, green onions, and/or lime wedges. -*Thai red chili peppers are recommended, however you could substitute the chili peppers for a minimum of 2 tablespoons of Sriracha instead. If going this route, add the Sriracha at the end (step #4). You may wish to add an upwards of 3 tablespoons of Sriracha, depending on your spice preference. -**The center stalk that runs down the length Kaffir lime leaves are tough, and best removed. Use your knife to make two lengthwise cuts, one down either side of the center stalk. Discard the stalk, then slice each half leaf into thin pieces. For a visual example, see 0:25-0:35 of this tutorial.